NHL News : Maple Leafs shake up lines for Game 3 without Nazem Kadri. Maple Leafs shake up lines for Game 3 without Nazem Kadri. Leafs forced to go with a new look. It would have come as little surprise if Toronto Maple Leafs head coach Mike Babcock had made the decision to shuffle his lines after the performance his team delivered in Game 2 of their first round series against the Boston Bruins in the 2019 Stanley Cup Playoffs. In fact Babcock had already shown an inclination to do so when he mixed up his lines quite a bit in the third period of Game 2, a game in which his team was thoroughly dominated by the Boston Bruins. The reality is however that the Maple Leafs really do not have a choice in the matter this time around as there is an expectation that one of their core forwards will be absent for Game 3. 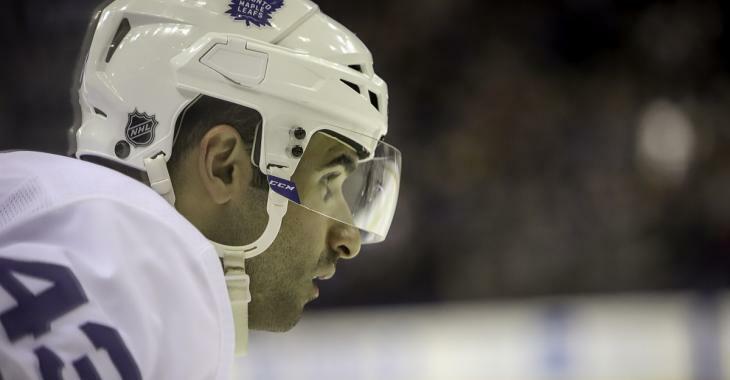 I am of course referring to the big suspension that is surely coming for Maple Leafs center Nazem Kadri, one that many expect will keep him out for the duration of the entire first round of the playoffs. Kadri is of course expected in New York today for an in person hearing following a vicious crosscheck delivered to the head of Bruins forward Jake DeBrusk, and an in person hearing is almost always reserved for a suspension of 5 games or more. On Monday morning the Maple Leafs hit the ice for their morning skate and for the first time we got a look at what their new lines are expected to look like for the third game of this series. With Kadri out it appears that head coach Mike Babcock has made the decision to move much maligned forward William Nylander to center where he will be flanked by veteran forward Patrick Marleau and Connor Brown on the team's third line. Here's a look at the Maple Leafs top four lines and defensive pairings from this morning as per Jonas Siegel of The Athletic. Looking at the lines it appears that forward Tyler Ennis will be the man who steps in to replace the suspended Kadri on Monday night, and there was one more takeaway from this morning as well. Although Leafs goaltender Frederik Andersen will remain the starter for Game 3 it looks like Michael Hutchinson will once again take over the back up role for the Maple Leafs, replacing Garett Sparks.